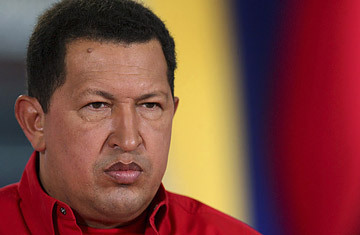 Venezuela's President Hugo Chavez pauses during his weekly broadcast Alo Presidente in Caracas, March 2, 2008. Few world leaders rattle a saber as flamboyantly as Venezuelan President Hugo Chavez does. On Sunday, in a piece of vintage Chavez theater, he ordered thousands of troops and tanks to the border with Colombia after that country's military had ventured a mile into Ecuador on Saturday to kill Raul Reyes, a top commander of Colombia's FARC guerrillas. The left-wing Chavez called conservative Colombian President Alvaro Uribe a "criminal" and a "lapdog of the U.S. empire," warning ominously that "this could be the start of a war in South America." Sure, Chavez and Uribe, two of Latin America's most outsized egos, loathe each other. Each has significantly fattened his military arsenal in recent years, and tensions have rarely been this high between their countries. Nor are they alone on the Latin street when it comes to martial upgrading: Brazil's 2008 federal budget, for example, includes a 53% increase in military spending, leading many to wonder if Latin America is undergoing an arms race not seen since the heyday of military rule across the continent. But that doesn't mean that either Chavez or Uribe can afford an armed conflict. Trade: Venezuela and Colombia's economies are too interdependent. Bilateral trade reached $5.5 billion last year, a 25% increase over 2006. Colombia buys Venezuela's petroleum products  Chavez controls the hemisphere's largest reserves  and Venezuela needs Colombia's agricultural produce even more. Despite the massive windfall Venezuelans have accrued from $100-a-barrel oil, they face sharp food shortages and the region's highest inflation rate. If Chavez were to exacerbate the situation by entering a war, his political popularity  which has dropped since he lost a referendum last year in which he sought greater powers and an unlimited tenure  would plummet. Colombia's Military Revival: A decade ago, the Miami-Dade County police force could have defeated the Colombian military. Back then, in fact, the Marxist guerrillas of the FARC had the upper hand in Colombia's four-decade-old civil war. But since Uribe took office in 2002, the armed forces have grown and modernized impressively enough to land body blows against the FARC, as demonstrated by Reyes' stunning demise. Chavez may have spent $4 billion over the past decade to buy everything from AK-47 rifles to Russian Sukhoi fighter planes, but the Venezuelan armed forces haven't seen real action since Chavez himself, then an army paratrooper, led a failed coup in 1992. So, Venezuela is likely at a military disadvantage  especially since many of its soldiers and officers aren't enthusiastic about either Chavez or the FARC. "There are too many Venezuelan generals who won't want to go to war over the FARC," says Michael Shifter, of the Inter-American Dialogue in Washinton, D.C. "Would they follow Chavez's orders?" Crude Facts: Right now, Venezuela can't risk any threat to its oil industry, which still accounts for a third of the nation's gross domestic product, half of government revenues and 80% of export earnings. Even the Organization of Petroleum Exporting Countries (OPEC), of which Venezuela is a founding member, reports that Venezuelan crude production is still well below the more than 3 million barrels a day that the state-owned oil monopoly, Petroleos de Venezuela (PDVSA), pumped before it suffered a debilitating management strike in 2002 and 2003. Experts agree that the shortfall in output is largely due to insufficient investment in infrastructure  the kind of facilities and equipment that often become ripe targets in a war. What Would the Neighbors Say? Neither Uribe nor Chavez needs any more bad international publicity right now. Uribe's domestic approval ratings may be higher than the Colombian sierras, but he can't secure a free trade agreement with the U.S., for example, because Congress is too wary of his government's alleged ties to Colombia's bloodthirsty right-wing paramilitary armies and because of human rights abuses by the Colombian military. Nor is he getting global kudos for sending his troops over a neighbor's border on Saturday in an operation denounced by Ecuador's leftist President and Chavez ally Rafael Correa as a brazen violation of sovereignty. But the hemisphere has cooled considerably toward Chavez's antics, and his defense of the FARC, which earns hundreds of million dollars a year via ransom kidnapping and protecting cocaine trafficking, isn't winning him much international sympathy. A war on his western border could also prove how freely the FARC roams inside Venezuelan territory  an allegation Chavez denies, along with the assertion by Colombian police that seized FARC documents show a long political and financial alliance between the Venezuelan leader and the Colombian rebels. A Hard Sell at Home: If Chavez has learned one thing from his idol Fidel Castro, it's how to summon the threat of the U.S. to distract his countrymen from problems at home. And if there is one thing Uribe has learned from his pal George W. Bush, it's how to manipulate the terrorist threat to amass greater executive power. But a cross-border war would most likely backfire on both men  especially Chavez, whose strategy this time may have been a miscalculation, as Venezuelans haven't exactly taken to the streets to answer his martial call. Chavez plans to seek another referendum on constitutional amendments such as abolishing term-limits before his current term ends in 2012. A big part of his argument to his countrymen will be that only he can stand up to Washington and its Latin American proxies. Venezuelans' tepid response to his Sunday tirade indicates that he faces an uphill battle to remain in office unless he starts resolving their domestic woes. The Red Line: Chavez, who considers himself the modern heir of South America's 19th-century independence hero, Simon Bolivar, still likes to wear his red army beret. But according to a recent Chavez biography, he once told a U.S. diplomat that for all his bellicose rhetoric, "I know where the red line is. And I'm not going to cross that line  I just go up to that little edge." He demonstrated some sense of the limits on his power by conceding defeat in the referendum last year when critics had widely expected him to reject it and cross the red line into Castro-style dictatorship. Chavez and Uribe both went up that "little edge" over the weekend, but the hemispheric hope is that both are well aware of the catastrophic folly involved in stepping over that boundary.